It’s that spooky time of year again. A bat theme seems appropriate, since Laurel proclaimed she is dressing up as a bat! Search for bat templates online. I found mine here and printed out the large bat. Look for wings that aren’t too long and skinny–those are harder to cut out and work with. This bat is 10-1/2″ from the tips of wing to wing. You could easily draw one out yourself too. 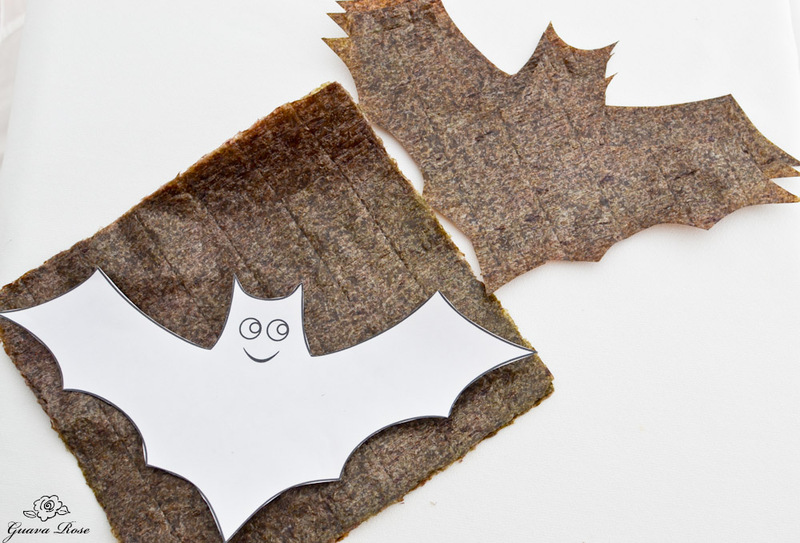 Cut out the paper bat, lay it diagonally atop 2-4 sheets of nori, and cut around the design. Repeat for however many bats you want. 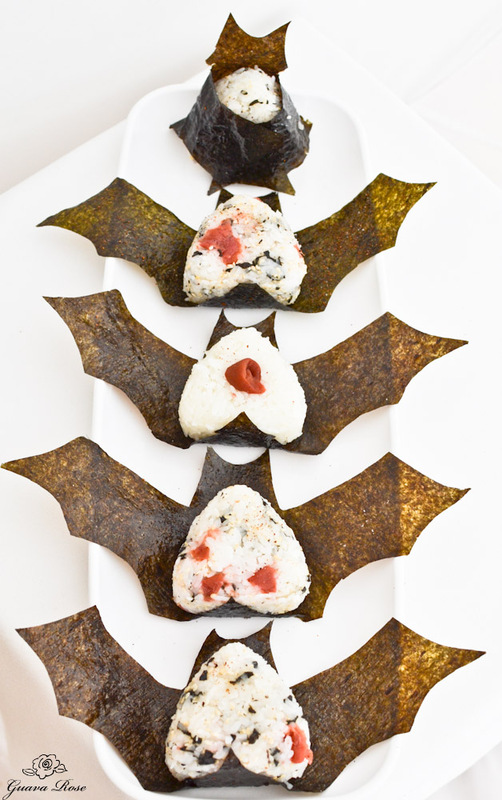 Brush each side of the bat nori lightly with olive oil. 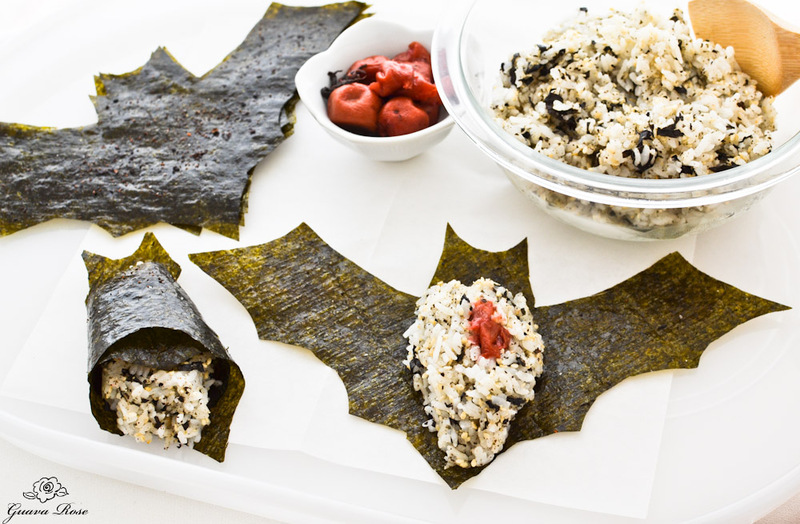 If you like spice, mix a couple of drops of sesame-chili oil into the olive before brushing it onto the nori bats. Sprinkle the top with sea salt. You can also add on garlic powder, onion powder, and dried chilies for more flavor. Bake at 350 degrees for 15- 20 minutes to toast it up a bit. 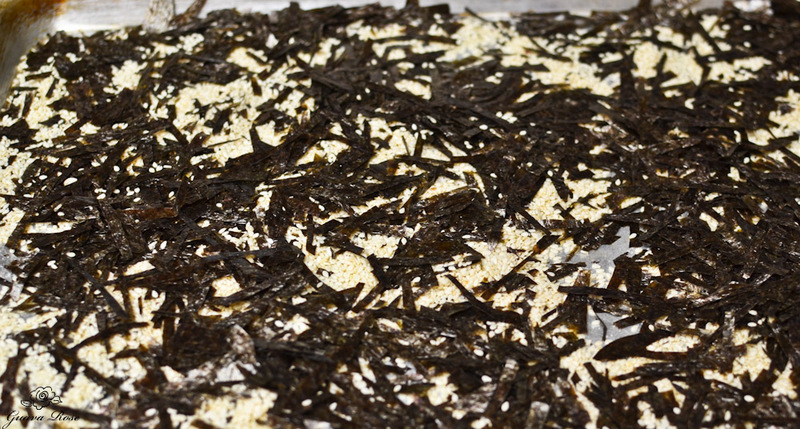 All the nori scraps are perfect for making a simple sesame seed furikake to season the rice. Tear the pieces into 1″ strips, then use some kitchen or clean scissors to cut the strips into small shreds. 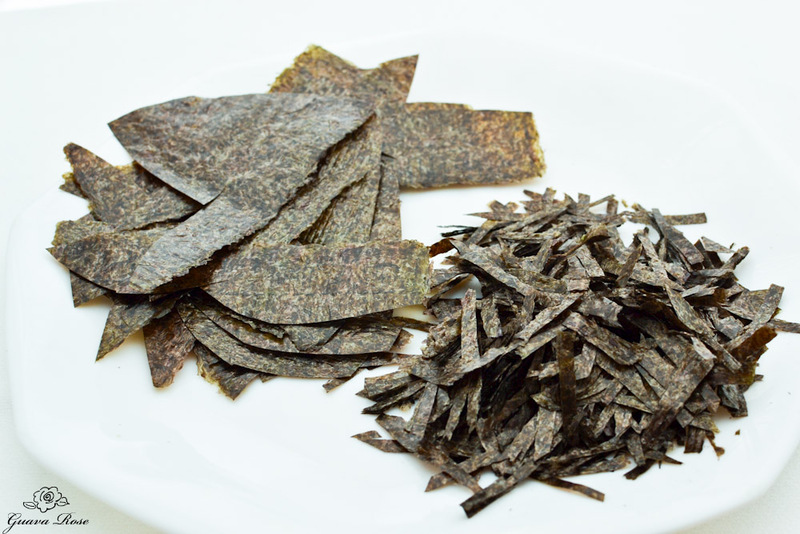 The leftover pieces from a typical 10 sheet pack of nori, after you have cut out the bats, should give you about 2 cups of small shreds. For the furikake, stir together shredded nori, sesame seeds, sea salt and a bit of sugar in a large baking pan. Bake at 325 degrees for 30 minutes, stirring half way through. Let cool. Mix some furikake into freshly cooked rice. It’s a good idea to make some with plain rice if you have kids who don’t like “stuff” mixed in. We tend to like the furikake mixed into the rice, as well as umeboshi (pickled plum) too. If you are serving these musubi freshly made, with the rice still warm, it’s a nice visual to leave the wings open, so everyone can see the wings, and wrap them around their own musubi. For musubi, the wrapping needs to be done while the rice is still warm, or the nori won’t stick to the rice. 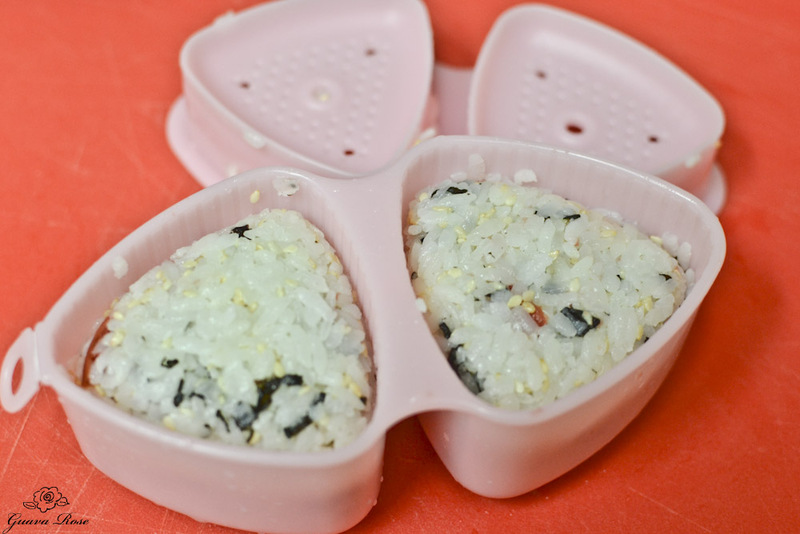 Remember to always place any rice on the rough side of the nori– the rice sticks better. Ahh…Come to me, my musubi! To serve a larger group, set up a bat musubi station and let everyone fill and roll up their own bat. Cooler rice which hasn’t been pressed in a mold, will stick to the nori without problems. 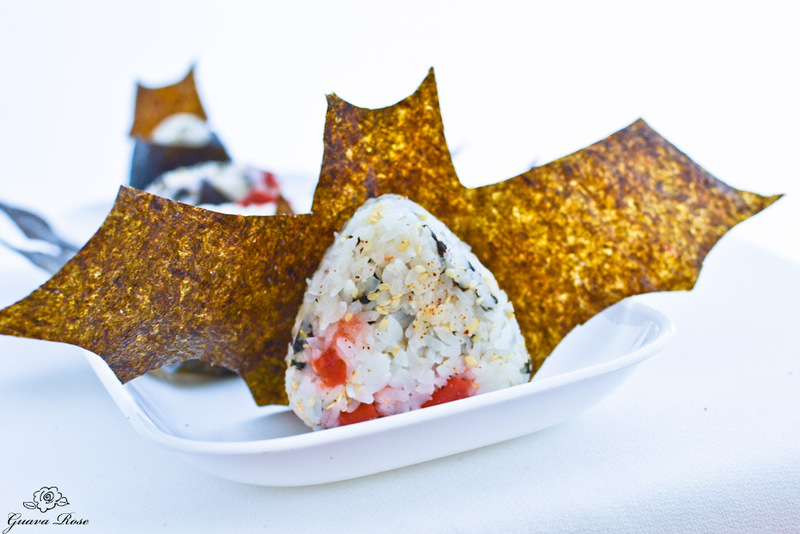 Half a piece of Spam cut lengthwise fits snugly into this bat musubi~ Spam Bat Musubi! I’ll end here with this bat musubi hugging a piece of spam. Preheat oven to 350 degrees. 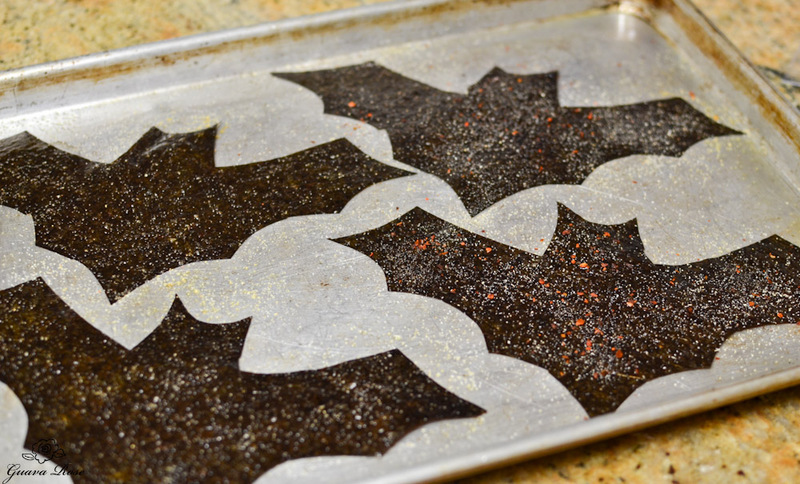 Place bat paper template on top of 2-4 sheets of nori. Pin template to nori sheets, or hold template firmly in place while cutting around the design. Repeat with remaining sheets of nori. Brush each side of bats lightly with oil. If using sesame-chili oil, only add a few drops to the olive oil before brushing onto the bats. Sprinkle with sea salt, then the onion powder, garlic powder, and/or dried chilies if desired. Bake for 18-20 minutes. The bats will be toasted, but not crispy. Set aside to cool. Reduce oven heat to 325 degrees. Place the sesame seeds onto a large baking sheet. Mix with the 2 tsp. sea salt and the sugar. Tear all the nori scraps into 1" strips. Use kitchen shears or clean scissors to cut them into shreds crosswise. Mix the nori shreds into the sesame seed mix. Bake in the oven for 30 minutes, stirring about halfway through. Remove from oven, stir, and allow to cool. Mix furikake well, and measure 1-1/4 c. into the fresh rice. Gently mix together. Add umeboshi if desired. Taste and add more furikake if needed, to taste. Store any extra furikake in an air tight container or jar. 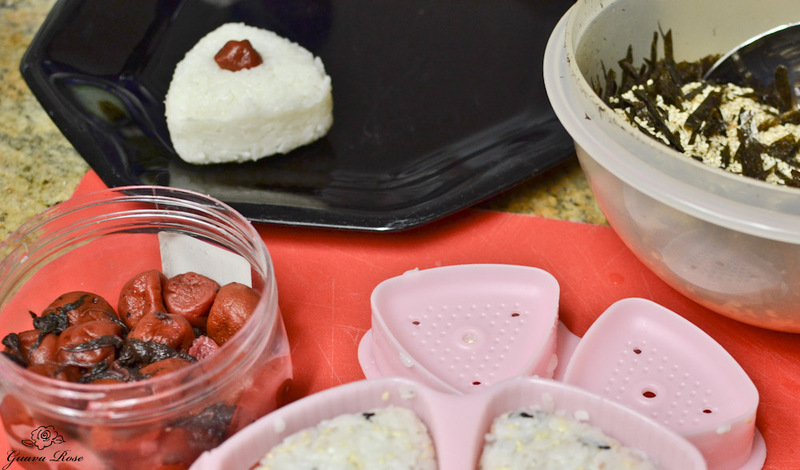 Mold the mixed rice into triangle musubi using about ½ c. rice for each musubi. 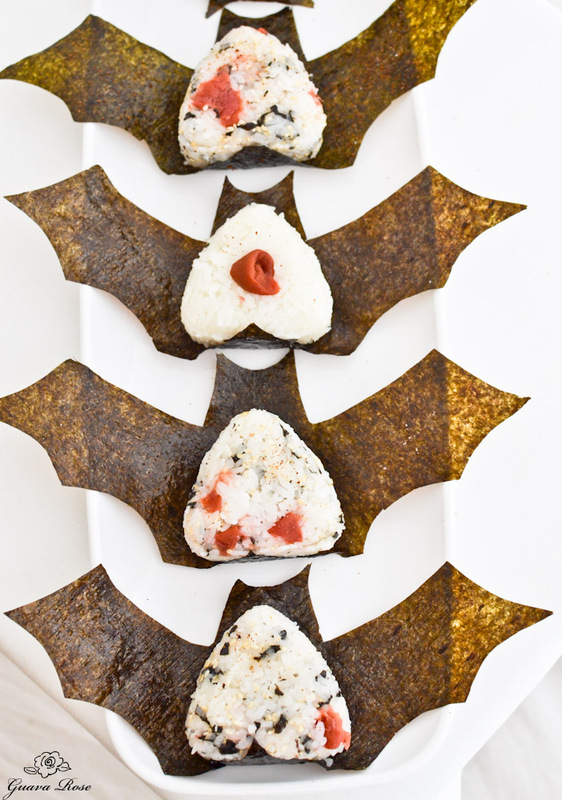 Place one musubi onto each bat body. Serve immediately while still warm so each person can wrap the wings around their own musubi before eating.